What Is An ABS Pump + How Does It Work? The Anti-Lock Braking System or Anti-Skid Braking System is commonly abbreviated as ABS and is an advanced braking technology installed on motor vehicles to prevent the wheels from locking up (ceasing motion) and skidding uncontrollably. It does so by pulsating the braking force delivered to the wheels similar to threshold braking, which is a technique commonly used in motor racing and the idea is to control the brake pedal pressure and apply maximum braking force to a point just before the wheels are about to slip. The ABS system improves vehicle control and will greatly reduce the stopping distance on dry and slippery surfaces, however, it can significantly increase the stopping distance on loose gravel and snow-covered roads where traction between the tyres and road surface is limited. ESP (Electronic Stability Control) works seamlessly integrated with ABS to further maintain tractive contact with the road surface by electronically controlling the front-to-rear brake bias. The ESP system, depending on the specific capabilities and implementation is also known as Electronic Brakeforce Distribution (EBD), Traction Control System (TCS), Electronic Stability Control (ESC) and Dynamic Traction Control (DTC). 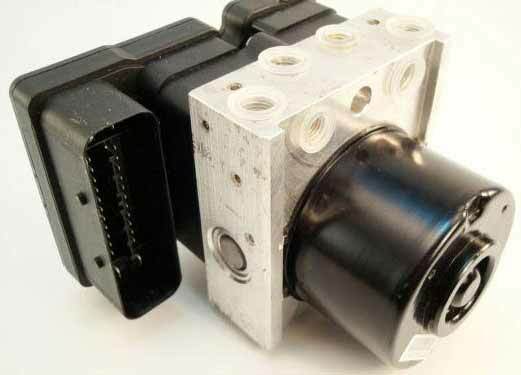 There are four main components that make up an ABS system; wheel speed sensors, hydraulic valves, a pump and an ABS controller, which is also known as an ABS Module or ABS ECU. The wheel speed sensor is used to determine the acceleration or deceleration of the wheel. These sensors use an ABS ring / reluctor ring which spins with the wheel / differential and creates a magnetic field around the wheel speed sensor, which in turn will generate the voltage in the sensor. Position One – The valve is open and any pressure from the brake master cylinder passes directly through to the brake. Position Two – The valve is closed, blocking the brake line and isolating the brake from the master cylinder. This prevents the pressure from rising further if the driver presses harder on the brake pedal. Position Three – The valve opens partially, releasing some of the pressure from the brake. The majority of issues with the valve system occur because of clogged valves. A clogged inoperable valve will be unable to open, close or change position and the system will fail in trying to modulate the valves and control the pressure supplied to the brakes. The pump in the ABS unit is used to restore the loss in pressure to the hydraulic brakes after the hydraulic valves have released it. Signals from the wheel speed sensors are processed by the ABS ECU Module and if a wheel slip is detected, the module will signal the valve to be released to avoid the wheel slip. After the valve is released and pressure lost, the pump is used to restore the lost pressure to the braking system. The ABS controller will modulate the pumps status to control the and provide the desired amount of pressure and reduce slipping. The ABS controller, also commonly known as an ABS ECU receives input signals from all wheel speed sensors and can interpret the information received to identify if there is a wheel slip on any one wheel. If a wheel spin is detected and a wheel loses traction, the controller will limit the braking force (EBD) and send the signal to actuate the hydraulic braking valves on and off. The ABS Pump + ABS ECU / Module is a very common failing part, which here at Sinspeed we have extensive knowledge in testing and repairing. If your ABS unit has failed, check out our ABS Repair category for some of the most common repairs we perform. If you have any questions, you can call us on 0844 847 9999. Tags : How The ABS System Works, What Is An ABS Controller, What Is An ABS ECU, What Is An ABS Module, What Is An ABS Pump. I drive a vW Jetta 6 2012 model. Of late it does not release the auto lock. I took the car to the VW agent but they have not been able to identify the problem. Recently it was suggested that I may have to buy a new abs pump even though there is no evidence that the problem is caused by the pump. How can you assist in such a case? The other issue is that there is no signal on the dashboard that the brakes are faulty. Even the diagnostic test by the agent does not indicate that there is a fault with the brakes. We can test the ABS unit and simulate it running as if it were on the vehicle, simulating all driving conditions. We test all units before and after remanufacturing to confirm the fault and that the repair is successful, before returning it with a lifetime warranty for complete peace of mind. If the unit is not faulty, we will return it with just a testing fee and return carriage.